Nullbyte ransomware uses sophisticated techniques to infiltrate computers and hide from its victims. Use Reimage to determine whether your system is infected and prevent the loss of your files. Can you fight against this ransomware infection? Nullbyte virus has recently hit the Internet, and the experts are still learning new things about it. There are several theories about the origin of this infection. Some researchers claim that Nullbyte is based on, or is a clone of Detox and Serpico ransomware which have been unleashed online not that long ago. Others debate on its potential connection to the new Cerber 3.0 version. While none of these theories have yet been confirmed, let us discuss the facts we already know about this fraudulent cyber infection. In this article we introduce this new cyber infection, discuss its basic working principles and recommend strategies that can help to avoid it. In the end, you will find Nullbyte removal suggestions and a detailed elimination guide. If you are desperate for a quick solution, you can initiate the system scan with an automatic antivirus software, such as Reimage. Undoubtedly, Nullbyte virus belongs to the category of ransomware infections. It uses a complex algorithm to lock hundreds of file types, adding _nullbyte extension to indicate the already encrypted ones. Such files may look something like this: “randomfilename.jpg_nullbyte”. Once all the intended files are encrypted, it is time to explain the whole situation to the computer owner. To do that, the criminals employ a lock screen on which they display a ransom note. There is no way such a message is missed because it will pop up every time you boot your PC. 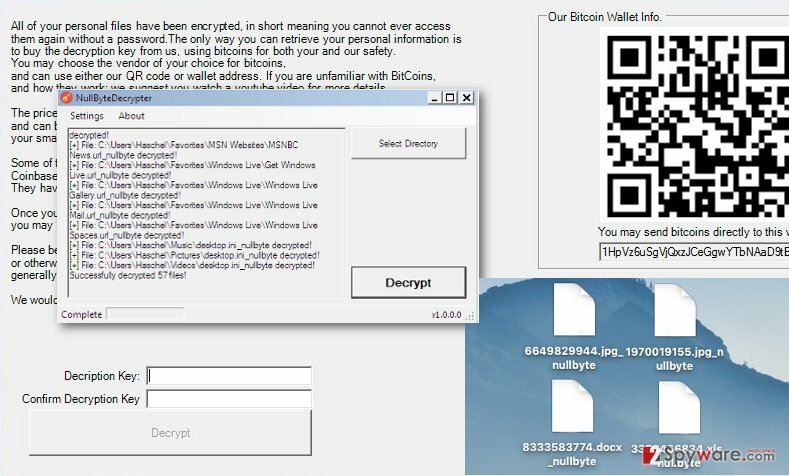 The ransomware lock screen window is already integrated with the file decryption function and provides a BitCoin wallet information in case you decide to buy out files. Sadly, most of the victims succumb to the ransomers’ demands and pay up. This way, the criminals are simply getting rich and receive funding for the creation of even more malicious programs. Though the ransom Nullbyte demands is not as obscene as most of the ransomware viruses are famous for (only 0.1 Bitcoin), it ensures a higher success rate: the users are less hesitant to pay smaller amounts of money to redeem their data. If you are already reaching towards your back pocket – don’t hurry. You can get your files back absolutely free. The security experts have investigated the infection and found some vulnerabilities that allowed to create a working Nullbyte decrypter. The link to this tool is provided in the ransomware elimination guide below. Just do not forget to remove Nullbyte from your PC before you run the decrypter and double-check the system when you are done. Though ransomware viruses are said to be among the most dangerous and unpredictable cyber infections, they can be avoided if you know how the main principles of their distribution. 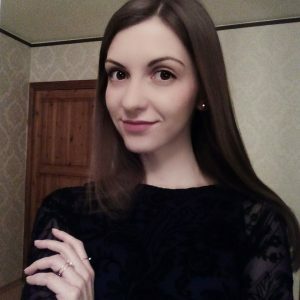 Reports show that Nullbyte may infiltrate computer along with the PokemonGo cheating program called “Necrobot.Rebuilt”. More commonly, though, it uses the regular ransomware spreading techniques, such as spam emails, fake software updates or the fraudulent “claim-the-prize” ads. So, the best way to fight this infection is to avoid it. Even if Nullbyte malware is already on your computer, you should not interact with it directly and use antivirus tools as well as trusted decrypters to decontaminate it and redeem your files. The danger level of the Nullbyte virus is high, so we want to emphasize again that you should not deal with this virus bare-handed. Use professional virus elimination tools, such as Reimage and remove Nullbyte from your computer without a trace. Also, do not rush with the data decryption. First, clean your device from any dangerous residue files which could later corrupt your data. Below, we have put a link to the NullByteDecrypter, but you will also find manual virus decontamination instructions in case the virus blocks the anti-virus scanner, or you are struggling with the Nullbyte removal for some other reason. Log in to your infected account and start the browser. Download Reimage or other legitimate anti-spyware program. Update it before a full system scan and remove malicious files that belong to your ransomware and complete Nullbyte removal. When a new window shows up, click Next and select your restore point that is prior the infiltration of Nullbyte. After doing that, click Next. Once you restore your system to a previous date, download and scan your computer with Reimage and make sure that Nullbyte removal is performed successfully. Guide which is presented above is supposed to help you remove Nullbyte from your computer. To recover your encrypted files, we recommend using a detailed guide prepared by 2-spyware.com security experts. Even thought the experts have already created a Nullbyte decrypter, some newer versions of the virus (if they are ever released) can be resistant to this tool. In such a case, we recommend you to try out Nullbyte recovery using Data Recovery Pro recovery software. Below you will find instructions how to do it correctly. So far, it is not known weather this infection deletes Shadow Volume Copies from the computers it infects. In case it doesn’t, you should definitely try recovering your data using ShadowExplorer. To recover your files after Nullbyte attack, download the NullByteDecrypter and follow the further instructions. This entry was posted on 2016-09-01 at 02:12 and is filed under Ransomware, Viruses. You can quickly scan the QR code with your mobile device and have Nullbyte ransomware virus manual removal instructions right in your pocket. How did you remove Nullbyte virus?